Last fall, I visited Amsterdam for the first time. As anyone who’s visited the capital of the Netherlands can tell you, it’s (maddeningly) always raining, or about to rain there. And sure enough, on my first day there, it was pouring. I was ready to spend the afternoon happily eating Gouda in bed, but my guide Joe insisted we go out, and handed me an umbrella as he led the way with cheery Dutch efficiency. When I got outside, and I opened the umbrella, I didn’t quite know what to do. Instead of the expected dome shape, this one was weirdly angled, with one shorter side and one longer one connected at a 135-degree angle — it looked like an upside-down check mark. “Wait, how am I supposed to use this?” I asked Joe. “Oh, you haven’t seen one of these before?” he asked, without waiting for my reply. “The shorter end is the front, and the longer part is the tail. You basically keep your head underneath the part where the canopy angles.” As we circled our way from Anne Frank’s house to Dam Square to the Rijksmuseum, I gave perfunctory nods; what I really wanted to know about was the umbrella. “Why does it look like this? Why am I not getting wet? 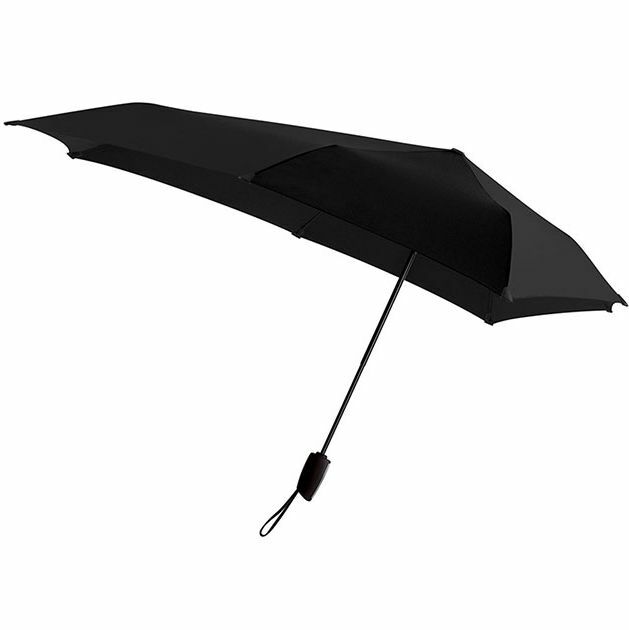 Do I get to keep it?” The Senz, Joe explained, was created by a Dutch industrial designer who wanted to make an umbrella that was storm- and windproof. 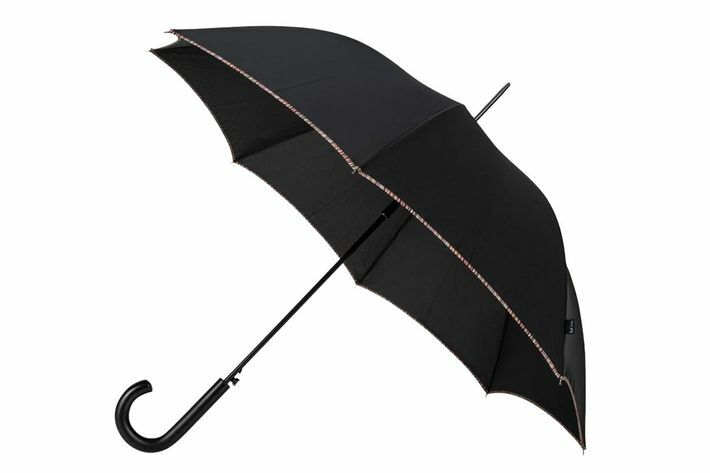 Unlike that of ordinary umbrellas, the shape is virtually impossible to blow inside out. “They’ve gotten really popular with the Dutch,” he said, and, indeed, I noticed that nearly two-thirds of the umbrellas people carried on the street were shaped like mine. 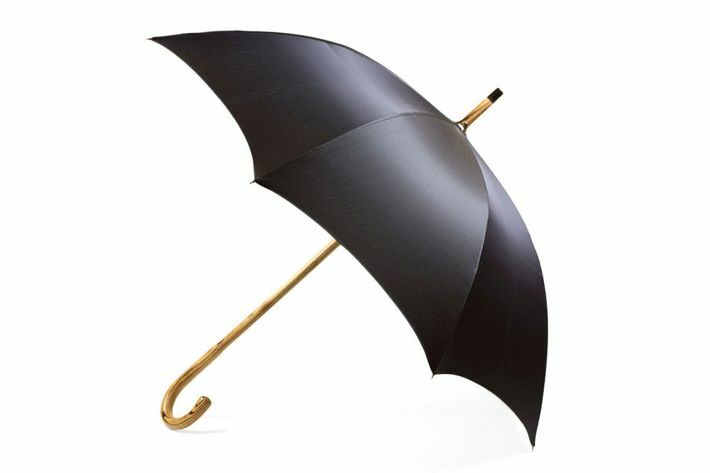 When I got home and found the company’s website, I discovered the Dutch designer was named Gerwin Hoogendoorn and that the umbrella works so well because it mimics the aerodynamic shape of a stealth bomber. Someone smarter than I am can explain it, but I do know that it’s never turned inside out like my Duane Reade Apt. 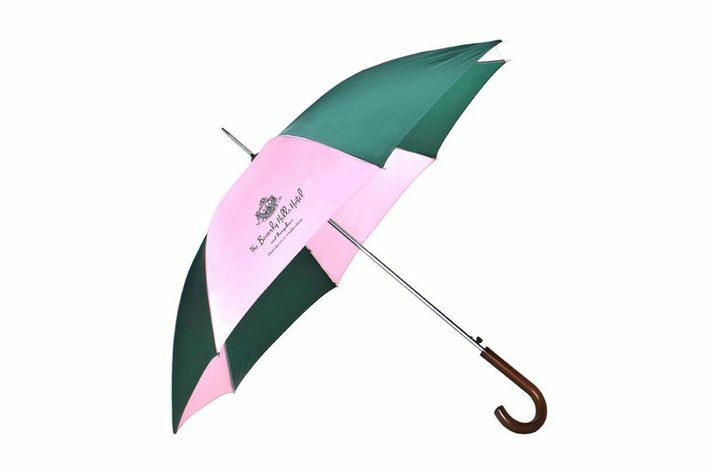 5 umbrella has, or that Core Club umbrella I inherited from a boss that came apart on my way to a work party, or that far-too-expensive Brooks Brothers one that was impossible to close. Because of the Senz’s funky canopy, there’s less fabric to wrap up, too, so the umbrella travels surprisingly well. Buy the Senz at Bergdorf Goodman or Amazon. science of us 1:59 p.m.
both sides of a breakup 12:39 p.m.
so you want to be president 12:34 p.m.
How I Get It Done: Reformation Founder Yael Aflalo On harnessing human laziness in the service of sustainability. beauty du jour 11:55 a.m.
What’s Going on With These #FreeBritney Protests? Some fans, convinced the singer has been confined to a treatment facility against her will, have taken to the streets. college admissions scandal 11:36 a.m.
Could Lori Loughlin’s Daughters Face Charges in the College Cheating Scandal? The actress is reportedly worried. This Bloodthirsty and Beautiful Bird Needs a Forever Home After killing its former owner, this cassowary is up for sale. The Photographer Who Captured 1960s London A new book revisits David Bailey’s iconic portraits. sure why not 9:21 a.m.
Kendall Jenner Is Coming for Your Teeth With a brand-new oral care line. keeping up with the royals 9:03 a.m.
What Will Meghan Markle and Prince Harry Name Their Baby? What the odds are, plus a few unbiased suggestions. isn't it romantic 9:00 a.m.
A Countryside Wedding That Ended With Fireworks A laid-back party with high production value.